The Navy plans to build nine 3,000-ton class KSS-III submarines for deployment in 2020, it said Thursday. The government has set aside W2.7 trillion (US$1=W1,104) for the project. "Submarines have to be at least 3,000 tons if they are to execute seaborne operations efficiently," said a Navy officer. "We decided to boost our submarine capacities to strengthen strategic deterrence and mobility." The Navy also plans to boost its procurement target for 1,800-ton class subs to nine by 2018 in order to protect cargo ships and assist in naval operations. 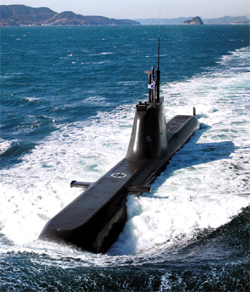 At present, Korea has 10 submarines in the 1,200-ton and 1,800-ton class. The Navy also wants to increase its procurement target for 7,600-ton Aegis destroyers from three to six and build six to nine more next-generation KDDX naval destroyers after 2023. "According to a study by the Defense Acquisition Program Administration, we would need at least three naval task force units in order to deal with a conflict in Dokdo and Ieo Island," said one Navy source. "We have to bolster our naval capacity to meet these needs." One naval task force unit consists of two Aegis destroyers, two Korean-type destroyers, two 3,000-ton subs, one transport vessel, 16 helicopters, three aerial surveillance aircraft and one logistics ship. At present, Korea has only one such unit. According to IHS Jane's Defense weekly, Korea's naval warfare capacity is equivalent to only 16 percent of China's and 33 percent of Japan's. This could rise to 22 percent of China's and 49 percent of Japan's by 2020. "We urgently need to bolster our naval warfare capacity, but the problem is money," said one government official. A 3,000-ton class sub costs around W1 trillion. DAPA projects it would cost at least W8.4 trillion to build three naval task force units. Navy Chief of Staff Choi Yoon-hee told a National Assembly audit on Thursday it would take 10 to 20 years to put together three to four such units. The Navy also projects a shortfall of around 3,400 sailors and has asked the Defense Ministry to bolster its manpower in stages until 2030. But the ministry apparently believes the Navy should maintain troop strength at the current 41,000.